I recently reported on several items I purchased, among them, a chain trim cardigan jacket by Michael Kors which I guess you can say had my name on it (or my initials anyway, since both of us share MK). I have to chuckle whenever I see someone wearing or carrying something by Michael Kors, emblazoned with the ubiquitous MK, because it seems as though they are advertising MY initials, and it reminds me that whatever I buy from the line needs no further personalization on my end. It always makes me think of Bottega Veneta's famous Seventies slogan, "When Your Own Initials Are Enough", which immediately summed up the small leather goods brand's logo-less principle of "Quiet Luxury". While it had disappeared in the late nineties, it resurfaced once again under Tomas Maier's supervision. 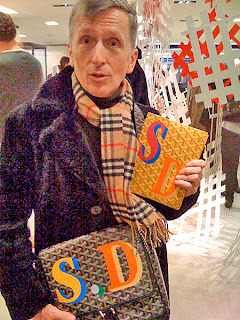 They took it a step further last April, with the launch of the INITIALS Project, (which was first introduced in a special pop up shop at their Milan headquarters during the course of the city's design week and has subsequently made it to the company's e-commerce stores in the U.K., the U.S., and Japan). There is an understandably universal appeal inherent in personalization, and because it instantly imparts a luxurious personal touch, it seems to naturally lend itself to the luxury market (though admittedly, in some instances, it can be a case of overkill). To wit, the LV monogram appears on most of Louis Vuitton's products and the Louis Vuitton Mon Monogram service enables customers to customize their Speedy, Keepall, or Pegase 55 wheeled cabin case, choosing from 200 million possible combinations. 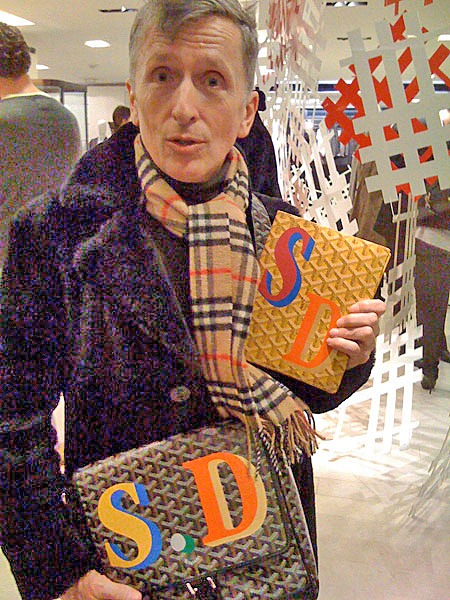 Similarly, Goyard's signature geometric pattern covers all their products, but owing to the addition of colorful, bold stripes and ones initials, legions of fans (among them, fashion insiders like Simon Doonan and Lynn Yaeger) can be easily spotted proudly toting around their beloved Goyard pieces. Of course, personalization is not just for the elite. It is quite democratic and readily available at all price points. 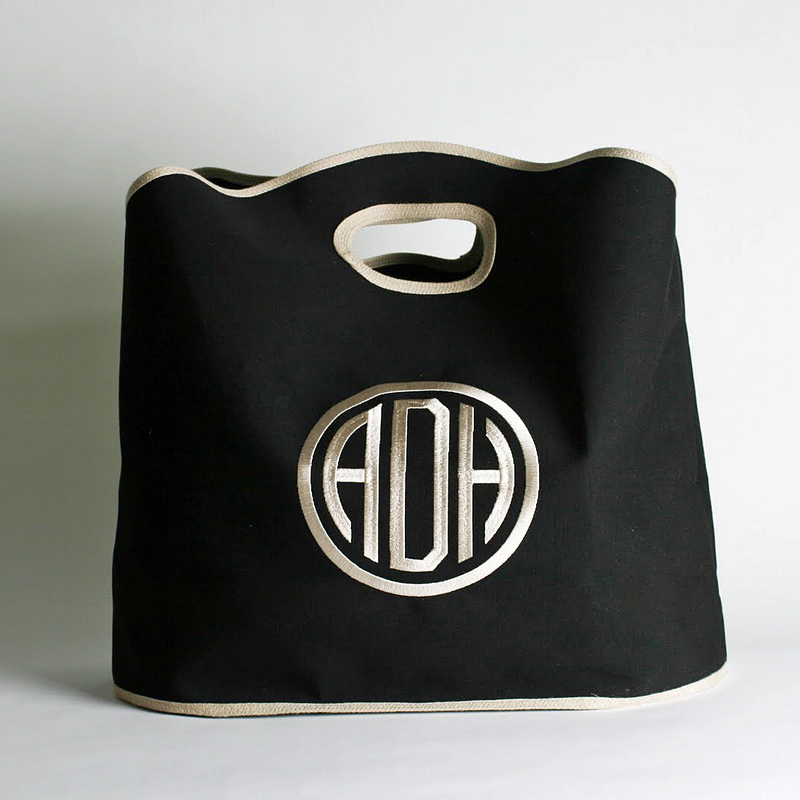 There are countless companies, stores, and boutiques, that specialize in gift-ready (whether it's a gift for yourself or someone special) personalization, offering monogramming options on a wide variety of products, and assuredly, some stand out more than others. On a recent trip to the San Francisco Bay Area, I was poking around the Town & Country Shopping Center in Palo Alto, when I found myself drawn to Bespoke Home (www.bespokehomeshop.com), a modern and luxurious monogram shop which offers a stylish selection of high quality, gorgeous home and gift items. The windows revealed a small, uncluttered store that was hardly run of the mill mall fare. It immediately appealed to my fashion sense with its chic, well edited selection that was classic, simple, yet elegant, and obviously, the painstaking bi product of someones' well trained, discerning eye. Once inside, I learned that it opened in 2011, and the owners, Abby Durban and Molly Gibbons, are longtime friends who both lived in London and New York and share a similar aesthetic, as well as the belief that the Bay Area sorely needed a place that offered customized products. Unsurprisingly, since I consider myself to be the original Bag Lady, (and I never met a chic, oversized tote in any combination of black and white, that I didn't like) it was the selection of classic yet distinctive bags that drew me in; especially the very large (25X19X9) Bar Harbour Tote in heavy black cotton canvas piped in ivory, $120, (monogram: $35). Other standouts are the Canvas Field Utility Tote in natural cotton canvas trimmed with leather, $270, and the Classic Canvas Tote Bag, $180. The latter is made in Maine, using natural canvas trimmed with a choice of red, navy, chocolate brown, and orange, and is a more tailored, luxurious take on the classic L.L. Bean Boat and Tote Bag (www.llbean.com). Quite frankly, it more closely resembles the Hermes version (but at a fraction of the cost). For more information, call 650 473 9177; or email: info@bespokemonogram.com. I think when it comes to business, be it in a physical store or ecommerce sites, what consumers are looking out for is a brand that they are all familiar with, like a recognition factor. That is why retailers or more like business people would use their very own initials to market making their products easier to recognize and sift through amongst all other products in the market. I for one, do not go for brand but quality and design instead.